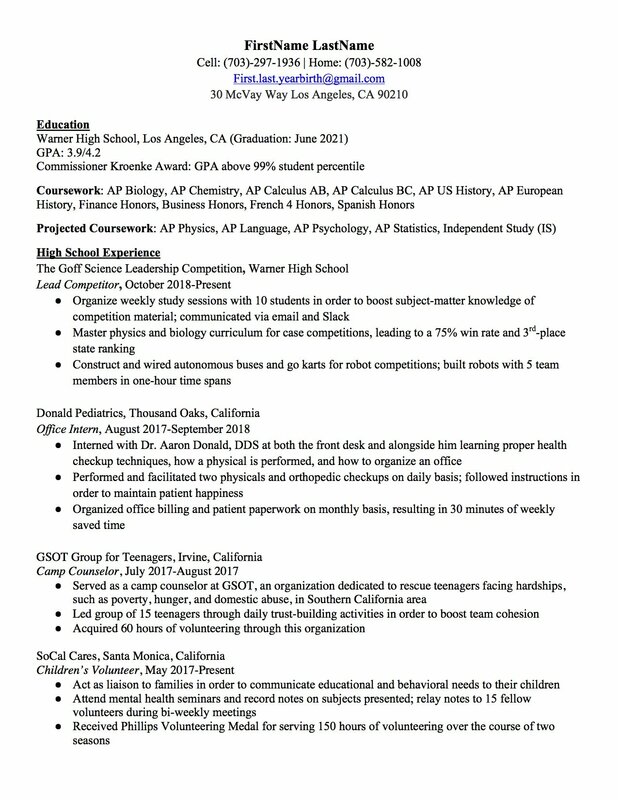 Need help creating or improving your high school resume? Enroll in our college application boot camp to get the counseling you need. A high school resume is an organized, professional-looking document. It lists your education, achievements, qualifications, work experience, skills, and awards. Some colleges require a resume for admissions, but all internships and jobs require at least a resume when applying. You might even submit a resume for scholarships. The resume advice in this article can be used for your college applications, internships, and jobs. If you’re in high school, you should start building your resume right now. This will make it much easier to upgrade your resume over the next few years. You’re going to use a resume for the rest of your professional life. Make sure to update it with pertinent information and new experiences. Let’s first start with some frequently answered questions students ask about high school resumes. How important is a high school resume for college applications? Your resume usually will not lead to an acceptance or outright rejection. But, a well-formatted high school resume can help you make your case for an acceptance. In the same manner, a poorly formatted resume with plenty of grammar mistakes and lies can undermine your chances of an acceptance. Why? Admissions officers want to admit students show curiosity for the university. A student submitting a sloppy resume is showing her lack of interest in her application. Undergraduate business, BS/MD, and honors programs frequently request a high school resume along with the application. In this case, the resume is more important than usual, so be sure to take your time and format it correctly (scroll down to find out how to format a resume). Your application, essays, and transcript are more important to college applications than a resume is. With that said, if you’re submitting a resume or the college asks for one, you must submit a high-quality resume. 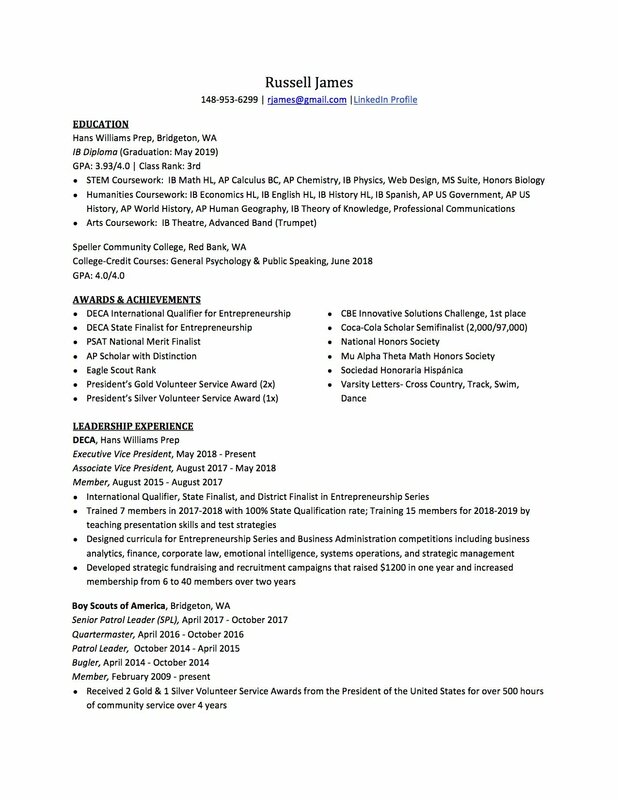 Is there an official high school resume template? No. A high school resume comes in many forms, so you have many choices to choose from. 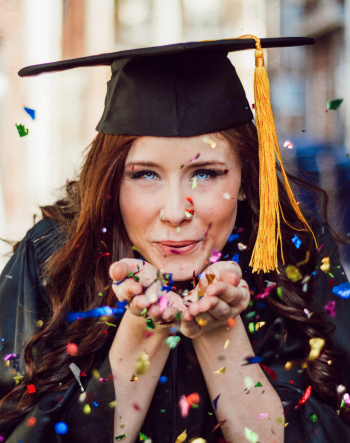 For high school students applying for college, internships, and jobs, you should embrace the best approaches for high school resumes. 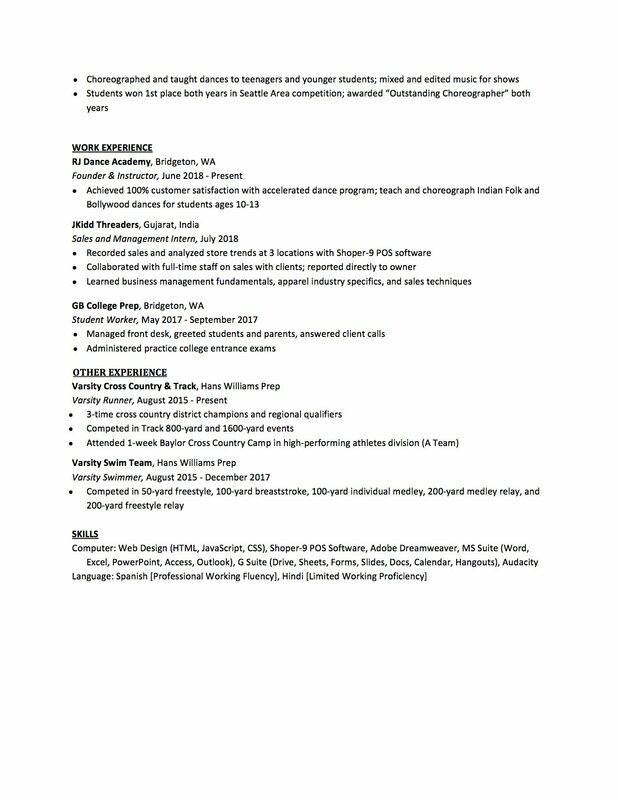 What is the best approach to writing a resume? The best resumes are concise and packed with substantive information. Remember, admissions officers and hiring managers are busy people, so you need to include pivotal information in your high school resume while wording your accomplishments in a concise and pithy manner. Last, your resume needs to be formatted correctly. 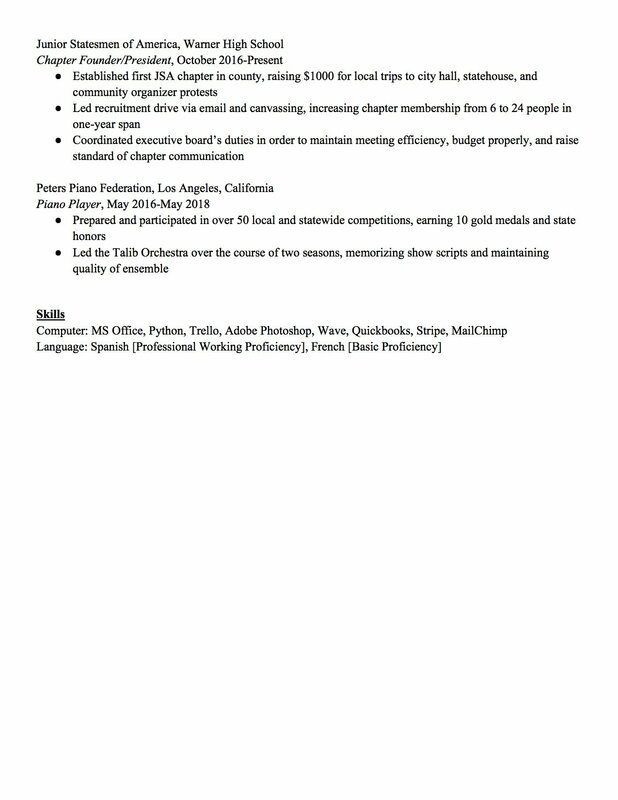 A resume that is formatted properly is easy on the eyes and, thus, will be much more enjoyable to read. Admissions officers and hiring managers are more likely to pay attention to resumes that are easy to scan and absorb. Try to keep the resume as close to one-page long. Over one page is OK for high school resumes, but it’ll be frowned upon later in your career. 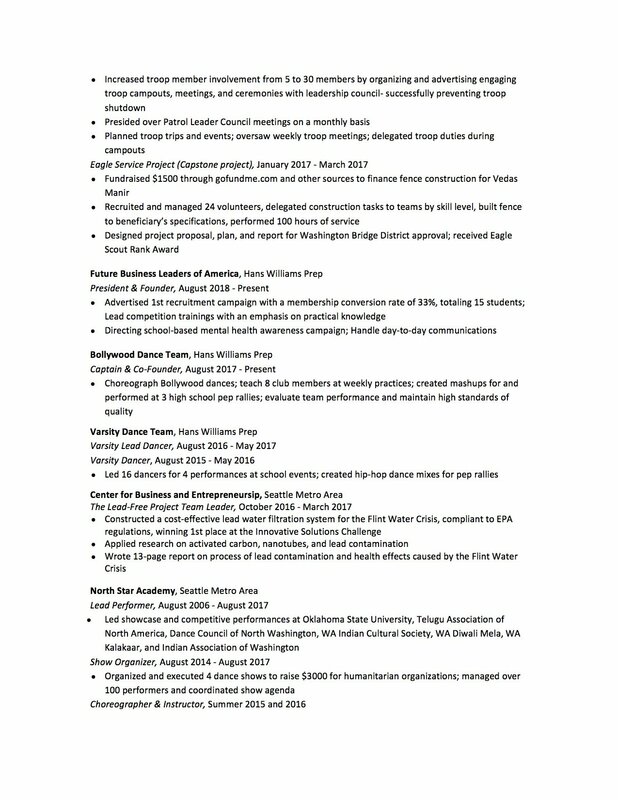 Should I use an online template for my resume? As a resume expert, I strongly recommend that you avoid copy and pasting online templates. Why? Each student is different. What might work for someone else won’t work for you. Some students have a great record of academic achievements but a sparse record of extracurricular activities. Some are business-oriented, while others are liberal arts-oriented. This means you should format your resume from scratch. Not only will you construct a resume that is customized to your needs, but you’ll also build resume skills that you’ll keep forever. These skills will come in handy in college and beyond. 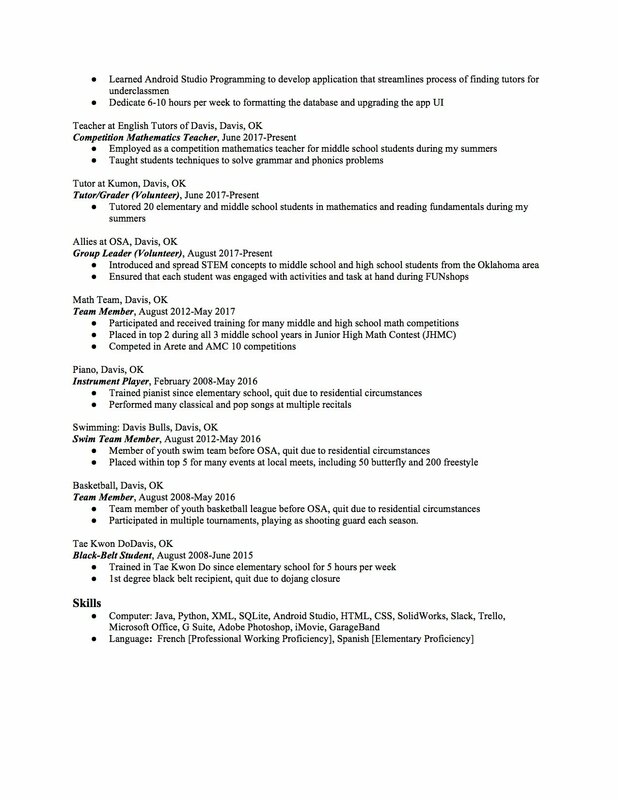 How do I format my high school resume? You should follow a few general rules when formatting your resume for college admissions, internships, and jobs. Use Times New Roman or Cambria on your resume. These fonts are easy to read. Regular font should be size 10-12. Headings should be at least two points larger than your font. Separate each section (Contact, education, experience, skills) with a heading that is underlined and/or bolded. Keep margins at 1 inch. If you need to shorten the length of the resume, .5 margins are OK. Anything less takes a toll on the eyes. 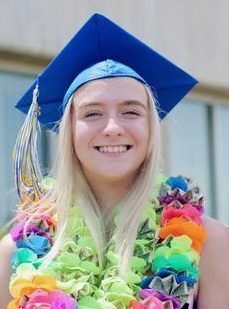 What information should my high school resume include? How do I format each section? You now know what makes a great resume. Now, let’s dive into the specifics. This is how you format each section. Your name should be centered at the very top in bold. The font size can match your headings, or your name can be a point or two larger than the headings. This information will go right underneath your name. Include the name you used on your college application. Underneath your name, put your cell phone number and professional email address. If your current email address [email protected], it’s time to create a new email. Use Gmail, since it’s secure and works with the G Suite platform, which you’ll use extensively in college. Last, you can put your home address if you so choose. Including your home address is not mandatory. You don’t need an objective section. Most objectives are common sense. They are clichés that provide no value to the document. The education section is easy as long as you know your academic information. Follow these steps. Then, list your honors right under your GPA. Below your honors, write “Coursework:” and input your highest, most prestigious classes. If you’re applying for an internship or industry-specific job opportunity, you can put related coursework. If you’re a freshman, sophomore, or junior, you can also add a “Projected Coursework” section, in which you’ll add courses you’re bound to take next year. Now comes the fun part. The quality of this section will determine the overall strength of your resume. You want to remember several critical tips before you dive into this section. First, your experience headings need to be evenly formatted. Don’t bold everything for the sake of emphasis. You should have two or more bullet points per qualification. When writing the location (“city, state”) of your qualification, make sure it’s formatted the same as your “city, state” in your contact section. As such, if your contact section has “Washington, DC,” then don’t add periods in “DC” in your “Experience” section. In general, watch out for inconsistencies when adding periods in state abbreviations – stick to one version: with or without periods. Second, your bullet points should be neatly formatted. All bullets should be fragments beginning with action verbs. You are not writing in the first person (e.g. “I collaborated”). Bullets should not end with periods. Choose specific action verbs. Try to avoid using weak action verbs, such as “worked,” “assisted,” and “helped,” among others. Action verbs should be in the past tense (e.g. “collaborated” and “managed”) unless you’re describing an experience that you’re a part of right now. In that case, your action verbs should be in the first-person singular tense (e.g. “collaborate” and “manage”). The roles you had most recently should be at the top. This means you’re following reverse chronological order. If you want to combine similar activities into one bullet point, separate them with a semicolon. Fourth, bullet points should be specific. Try to tell a story. Include results. Include numbers, figures, percentages, or anything else that will help you demonstrate your ability to procure results. If you’re having trouble thinking of details to include, think of the who, what, when, where, why, and how of your job duties. Remember, the admissions officer and hiring manager don’t know who you are, so it’s your job to paint a picture of your qualifications. Hint: You can use these bullet points in the extracurricular activities section on your college application. Does that make sense? Good. Let’s look at what a properly formatted experience section looks like. Write the workplace or club name on the top line. Next to it, write the location. On the next line, write your position in italics. Next to your position, write the date (month year – month year) during which you worked in that position. Writing out the entire month is not important; what matters is sticking to the format for all your experiences. The bullet points go under the position and date. Repeat this several times until you’ve addressed each one of your pertinent activities, work experiences, and engagements. This section usually focuses on two elements: computer and language. Next to “Computer:” list the things you can do well using, you guessed it, a computer. This can range from coding to graphic design to PowerPoint to CMS to software. Limited working proficiency – You can read and write here and there but wouldn’t be able to do business fluently. Underscores are your safest bet when naming a resume. They render your resume easy to organize so admissions officers and hiring managers don’t lose track of them. Over the years, you should update your resume. Spend 30 minutes every few months adding experiences and job duties that will help you attain your next opportunity. As you grow older, your resume will need to be more specialized. This means you’ll need to add more experiences, duties, qualifications, skills, and credentials that relate to your industry and desired position. Between senior year of high school and college, your resume will look completely different. In order to ensure you’re updating (or upgrading!) you resume correctly, use the notepad in your smartphone to record your job tasks and duties. If you were asked to do something new, expand your skill set, or develop talents, you need to add these in your resume. The notepad in your smartphone will be a useful resource for when you sit down to upgrade your resume – it will keep your memory fresh and prevent you from hitting writer’s block. As an exercise, spend a few minutes every year perusing your notepad, witnessing your professional growth. 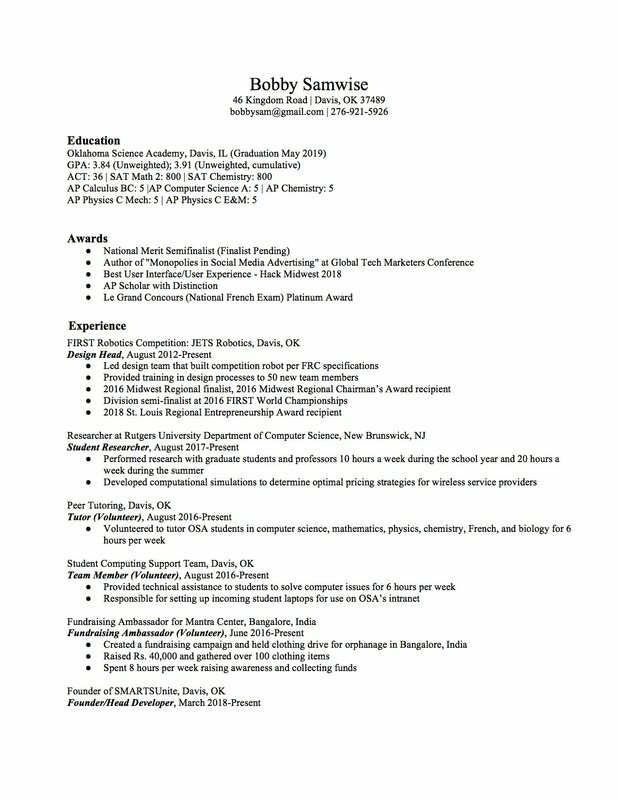 Finally, if you were looking for outstanding samples of high school resumes, I got your back. As I mentioned before, don’t just copy and paste your items into the resume. Instead, take the time to scrutinize action verbs and bullet-point formation. Check to see if the grammar and data make sense. You can also look at them below. Enjoy! Tags: Career, High school transcript, Jason P.